2 5/8 by 4 3/4 in. 6.6 by 12.05 cm. Jay DeFeo (born 1929, Hanover, New Hampshire; died 1989, Oakland, CA) was relentlessly experimental. Though known primarily for her monumental painting The Rose (1958–66), her visual and poetic associations play across a remarkable array of media and material. 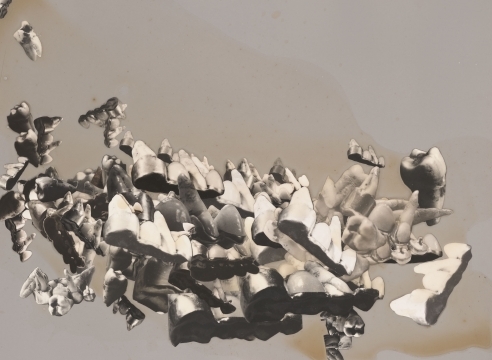 This focused exhibition highlights DeFeo’s prolific use of photographic practices as an under-examined but critical facet of her transmutative process. Building upon four works in SJMA’s permanent collection as guiding linchpins, the exhibition draws largely on previously unpublished and unexhibited works from the rich holdings of The Jay DeFeo Foundation to consider this important element of DeFeo’s practice within the context of her multimedia work, significantly deepening and extending her important legacy beyond painting and drawing. Though used throughout her career to record, compose and revisit, DeFeo’s photographic output increased dramatically during the 1970s. DeFeo famously produced no artwork from 1966–1970, resting and recovering after the emotional, physical, and creative toll of The Rose. It was the camera that facilitated her return to artmaking. As DeFeo herself put it, for three years from 1973–75, “I did nothing but photography.” (Despite the inaccuracy of this statement, her enthusiasm for the medium is clear.) 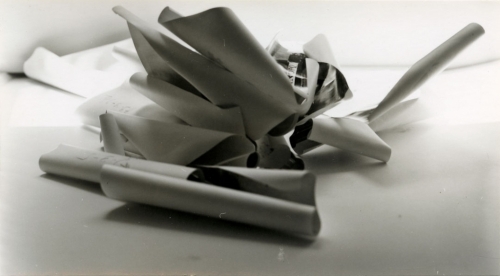 Rather than signaling a new direction, however, the large body of photography DeFeo produced during the 1970s is both reflective of and integral to her painting and drawing process. “More so than most artists, I maintain a kind of consciousness of everything I’ve ever done while I’m engaged on a current work,” DeFeo wrote in 1978. Her photographic work operates within a prolonged consideration of primal forms and elemental symbols, an exploration of the mythological and symbolic links uniting the cosmos to studio objects and to life around her: the undersoul, as her friend Beat poet Michael McClure termed it. DeFeo used the camera to capture symbolic resonances in formal qualities—texture, line, and shape—of objects and artworks in her studio and the world around her, which then transmute across media. Undersoul: Jay DeFeo features unique photographs, photo collages, photocopies, drawings, and paintings from the 1970s and 1980s that track the artist’s visual vocabulary across media and subject matter.